BottleMark Custom Bottle Caps and Labels: For Home Brewers and more! for home brewers, breweries, scrapbookers, crafters, brides & grooms, and you! Custom crown caps. Any design. No shortcuts. We print any design directly on standard crown caps and send them straight to you. 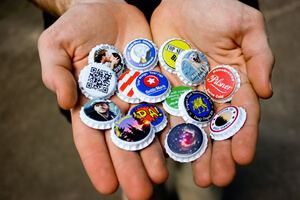 Upload an image to create a custom bottle cap instantly, or choose from our design library. Photo friendly, no color limit, and no minimum order. Starting at 17¢ each, with low shipping costs and digital samples available. Custom beer bottle labels. Perfect for the home brewer. Our labels are waterproof, go on easy, and come off clean. So much better than generic labels for the home brewer. Upload an image to create your custom bottle labels. Minimum order is just one sheet of six. Starting at 60¢ each, with low shipping costs. Bottle confusion? Custom bottle caps are the easiest and cleanest way to label your beer—you're going to put them on and take them off anyway! Complete the look of your bottle! Don't settle for plain gold caps just because you don't make millions of bottles a year. Great for small runs and seasonals. Punch up your memories with flattened bottle caps, or decorate your fridge with smiling faces on bottlecap magnets. The creative possibilities are endless! Custom bottle caps make great giveaway items; they're memorable, unique, and easy on the budget. Great for drink tokens, or put 'em on a bottle for a memorable favor! Traditional printed crown corks (the industry term for "bottle cap") have a minimum order of about half a million per design. That's a big pile! BottleMark does personalized bottle caps on demand, in full color, with no minimum order, and in a matter of days. It's a huge leap in bottle cap technology! Our web-based instant upload and design tool is also fast and innovative. We use the latest in web technology (and then some!) to make ordering your design easy and instantaneous. "I’m thrilled with the way the caps turned out. Thank you." "Your site made it so easy and economical." "Your website is a great tool for homebrewers. It gives so much control to the cap designer and does it at a great price." "I am very happy with the quality and fast service." 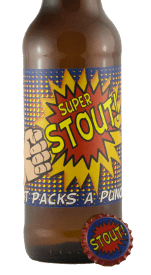 "I will definitely praise you guys in all the brewing forums and tell all my friends about your site." "I would like to start by telling you how cool I think this is. I just received an order I placed last week and they came out great!" Create your own custom bottle caps and labels now and see what they're talking about!